Endure, put up with whatever comes your way, learn to overcome weakness and pain, push yourself to breaking point but never cave in. If you don’t learn that lesson, you’ll never succeed as an elite athlete. At the end of the 2008 tennis season, Rafael Nadal was French Open, Wimbledon and Olympic Champion. His achievements during 2008 earned Nadal the Number 1 ranking, ending the 4-year reign of Roger Federer at the summit of the sport. So entering the 2009 tennis season, Nadal was full of confidence and was a feared opponent due to his combination of talent, endurance and fierce competitiveness. Federer more than anyone was aware of this, with their career head-to-head record starting to increasingly sway in Nadal’s favour (6-12 to Nadal at the time). However, despite his dominance of the sport, the Australian Open was an event that had previously eluded Nadal. But there proved to be minimal stress for Nadal in the first week and a half of the 2009 Australian Open, reaching the semi-finals after five consecutive straight sets victories. Nadal was seemingly unstoppable. To make things even better, waiting for Nadal in the semi-final was his compatriot Fernando Verdasco, a player he had never lost to. In their previous encounter in the 2008 French Open, Nadal won 6-1, 6-0, 6-2. The semi-final should be a mere formality. But Fernando Verdasco was in the form of his life. Having broken into the Top-20 for the first time during the 2008 season, Verdasco made an immediate impact at the start of 2009, making it to the final of the Brisbane International en route to Melbourne. He then progressed through the first 3 rounds of the Australian Open conceding only 4 games in each match. Not even Nadal could match that effort. He then knocked out both Andy Murray (already Number 4 in the world) and Jo-Wilfred Tsonga (former finalist) to setup the clash with Nadal. The semi-final was held in the Friday Night prime-time slot, with the winner to face Roger Federer in the final on Sunday. Federer had comfortably disposed of Andy Roddick in little over 2 hours the night before and now had 3 days to prepare for the final. But there was an extra element to the Nadal-Verdasco clash that was going to test the resolve of both players. Melbourne’s weather that day had topped 40°C and the slight evening cool change was only a minor relief for the players. It was so hot on the court that both players rushed to drape ice packs around their necks and shoulders in the breaks between games. The match itself was of exceptional high quality, and combined with the intensity and physical exertion both players put into every point, the match became riveting viewing. The first set alone lasted 75 minutes. And when Verdasco managed to secure that first set in a tense tie-break, the crowd was abuzz. Nadal had a match on his hands. Long rallies, outright winners, extraordinary recoveries from impossible positions, the match had it all. But after Nadal took the second and third sets, a semblance of normality was returning. He was back in control. Except Verdasco wouldn’t give in. Pushing the fourth set to a tie-break, Verdasco played a near flawless tie-break to push the match into a deciding set and carrying momentum. Unfortunately for Verdasco, his opponent was Rafael Nadal, the player who had been trained both physically and mentally by his Uncle Toni since he was a young child to rise to the occasion in moments like this. But even for the greatest it is not always that straight forward. Rafael Nadal: In the very last game, just before the very last point, my eyes filled with tears. I wasn’t crying because I sensed defeat, or even victory, but as a response to the sheer excruciating tension of it all. I had lost the fourth set on a tiebreak, and that, in a game so tense and in such conditions, would have been devastating had I not been able to call on every last reserve of mental strength I’d accumulated over fifteen years of relentless competition. I was able to put that blow behind me and begin the fifth believing I still had it in me to win. In a heartbreaking way to finish a match of such high quality, Verdasco double-faulted. After 5 hours and 14 minutes, the longest match in Australian Open history   was finally over. The combination of quality, intensity and drama ensured the match a place as won of the greatest of all-time. But for Rafael Nadal, there was still a final to play, and his exhausted and wounded body had precious little time to recover. The match ended at 1am in the morning and Nadal did not get to sleep until after 5am. Nadal’s support staff worked on his aching body day and night to do everything to get him ready for the Sunday final. He aborted training on the Saturday and then during his final attempt to return to the practice court ahead of the final on Sunday afternoon, he broke down with cramp in one of his calves. The situation did not look good, and Nadal knew it. One final pep talk from Uncle Toni and Nadal went out for battle. And circumstances called for a change of strategy - keep points shorter and take more risks. The strategy worked. With adrenaline flowing and the body warm, he began to feel better as the match went on, despite the match extending into a fifth set. And after over 4 hours of tennis, potentially the only player capable of recovering from that debilitating semi-final had completed the impossible. Federer was crestfallen. Rafael Nadal: At 2-0 up in the fifth set I turned to where Toni, Carlos, Tuts, and Titín were sitting and said, just loud enough so they could hear, in Mallorquín, “I’m going to win.” And I did. Toni had been right. Yes, I could. I won 7-5, 3-6, 7-6, 3-6, 6-2, and I was Australian Open champion; to my astonishment I had come back to life, and there it was, my third of the four Grand Slam titles, now my sixth in all. Roger Federer was as mentally broken after the match was over as I had been physically before it. I’d have felt the same way in his place. He’d played a bad final set, and by beating him I had consolidated my standing as world number one. 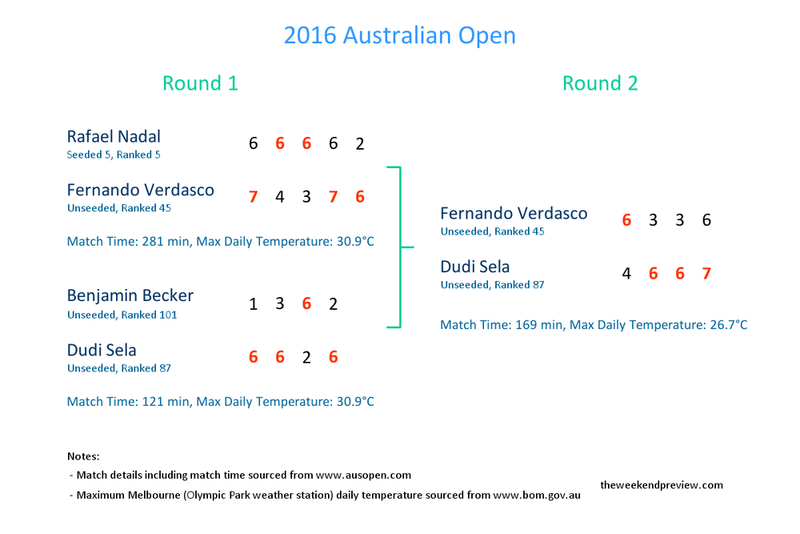 As fate would have it, Verdasco was able to extract some semblance of revenge in the first round of the 2016 Australian Open, winning another extraordinary 5-set encounter in stifling heat. Verdasco fought back from 2 sets to 1 down and 2-0 down in the 5th set to win 7-6, 4-6, 3-6, 7-6, 6-2 in 4 hours and 41 minutes. But at the elite level of the sport, what can separate Nadal from the lesser mortals of the sport is their ability to recover and always go that one more time, mentally and physically. In the case of Verdasco, sore and exhausted after playing in a sauna for over 4 hours, he went on to disappointingly lose his next match to the 87th ranked Dudi Sela in 4-sets. Injury and fitness appears to be a recurring theme in this year's Australian Open. And it is likely to continue to be the case as the heat wave is about to hit Melbourne. Injuries to Nadal (knee), Djokovic (elbow) and Wawrinka (knee) has restricted each player to minimal pre-Tournament match practice, whilst Andy Murray and Kei Nishikori withdrew before the tournament even started. Underdone seeds such as Raonic and Isner also succumbed to disappointing losses in the opening round. It would appear that maintaining your body at a sustained peak fitness at the highest echelons of the sport is not an easy task. Well, there is one exception. Nadal, R. & Carlin, J. (2011). “Rafa: My Story”, Sphere, London, United Kingdom. The 2009 Nadal versus Verdasco semi-final was overtaken as the longest match in Australian Open history by the epic 2012 final when Novak Djokovic defeated Nadal in 5 sets over 5 hours and 53 minutes to claim the title. Although often quoted as being played over 5 hours and 14 minutes, the match statistics on the official ATP Tour website has the 2009 Nadal versus Verdasco semi-final as being of 5 hours and 10 minutes duration.